Climate Change Minister James Shaw has responded to a letter I sent him with a diagram showing that when methane is in constant flow it is effectively at net zero because all emissions of methane are offset fully by the oxidation of methane to CO2 and H2O. The whole goal of the carbon zero act is to get to a point where emissions of greenhouse gas are offset fully so that the atmospheric concentration of greenhouse gas remains constant. That is what they call ‘Net Zero’. Achieve that they say and we stop global warming. Reducing long-lived greenhouse gas emissions to zero and stabilising our short-lived gases, would mean our domestic emissions would not contribute to any further increase in global temperatures. Finally a Minister of Climate Change who understood it I thought. Alas though the Minister’s letter indicates the Minister does not understand it all. The Minister states in his letter. Your ‘Net Zero CH4’ diagram shows the way methane is broken down in the atmosphere. What it doesn’t capture is the increased warming effect methane has (relevant to carbon dioxide) while it is in the atmosphere. If methane emissions from ruminant animals are stabilized in New Zealand, the net warming effect of these emissions would be constant. Having a constant warming effect is not the same as having no warming effect. 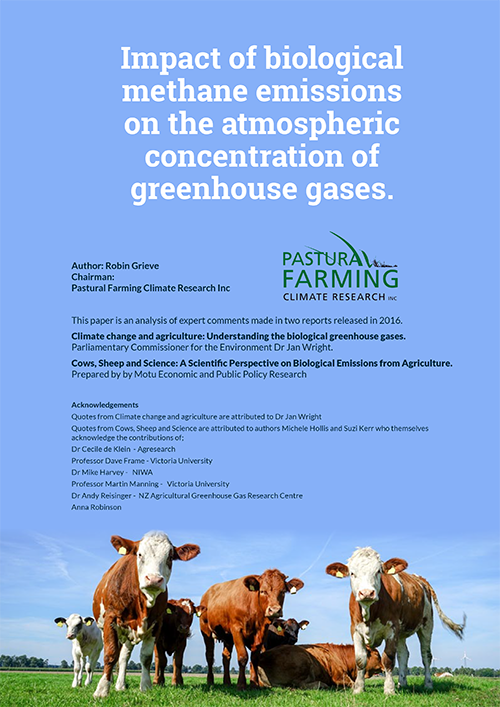 The increased warming effect methane has (relevant to carbon dioxide) while it is in the atmosphere is the line Climate Change Ministers and officials have been rolling out for over a decade and it is nonsense. This is so frustrating and I fear we are back to square one with a Minister who does not get it. His letter demonstrates a lack of understanding and also appears to contradict his own Ministry’s consultation document on the carbon zero bill. So in summary emissions that cause no further increase in global temperature also have a constant warming effect according to the combined logic of the Minister and his Ministry. The problem is that the Minister and too many other people are hung up on the different warming effects of methane and CO2. They can’t see past that and realise it is completely irrelevant unless the emissions are causing the atmospheric concentration of greenhouse gas to increase. They need clear their minds and realise that the only thing that matters is what is happening to the atmospheric concentration of methane. If it is going up it is causing global warming, if it is remaining constant it is not. The talk of constant warming by the Minister is nonsensical. The Minister may be referring to what people like Andy Reisinger incorrectly label as ‘warming’, which is the increased temperatures that exist today that are caused by historic emissions having elevated atmospheric greenhouse gas above pre industrial levels. If that is the case what he has not considered is that this equally applies to atmospheric levels of CO2 which will be considerably higher than pre industrial times when and if emissions ever get to net zero. I fear the Minster is confused and who can blame him with people like Reisinger muddying the waters but what he should realise is that what he says should be logical and it is not. It is only in the global warming world where nonsense like this is allowed to flourish. I will write back to the Minister and as him to clarify what he means by constant warming.